Mozilla's Firefox browser used to be the fastest browser available for the Windows operating system. Unfortunately for Firefox users, many issues with Firefox which affect page speed and overall smooth operation of the browser have not been fixed as-of-late and that means we're stuck with a sluggish browser. 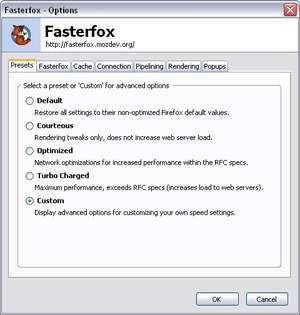 Fasterfox is a Firefox addon which does a few things to speed up browsing speed. For one thing, it uses something which Google has started using in Google Chrome called prefetching. Version 2.0.0 is a freeware program which does not have restrictions and it's free so it doesn't cost anything. For security reasons, you should also check out the Fasterfox download at LO4D.com which includes virus and malware tests. Additional screenshots of this application download may be available, too. Fasterfox download been highly rated by our users.